In other Topic Papers in this series, we show the various advantages which would be expected to follow from the introduction of Land Value Taxation (LVT) in this country. In this Paper we will consider actual examples where either LVT or policies designed to produce the same essential effect, have actually been applied. “Land” – a word used by economists to mean natural resources of all kinds – is fundamentally different from the things which people have made. It should therefore be treated as such for economic purposes, and particularly taxation. The commonest way of applying that principle in developed societies is by LVT. This requires that the value of every piece of land should first be assessed, and a tax should then be collected, related to that valuation. To do this, it is necessary to assess and collect only true land values: the value of the land under a house, for example, and not the value of the building people have put upon that land; the value of the land on a farm, ignoring the value of farm buildings, artificial fertilizer, crops and stock; the value of the land under a factory, as distinct from the value of the building and the machinery it contains, and so on. Where LVT is applied for purposes of local government finance, it is sometimes called Site Value Rating (SVR). Land Value Taxation in practice. It is important to remember that what is called a “Land Tax” may be very different from LVT. Thus, there was a so-called “Land Tax” in Britain which began in the late seventeenth century, and of which vestiges persisted right down to the twentieth, which was really a sort of “wealth tax”, not LVT at all. A short, but very informative, book by Tony Vickers, entitled Location matters: recycling Britain’s Wealth (Shepheard-Walwyn Ltd., London, 2007) gives modern examples of applications of the principle of L VT, and discusses them in more detail than here. None of the cases studied has applied the principle to its full extent, but all have gone some way towards it, and all have benefited from what they have done. Australia collects about 8.6% of all its taxes (local, State and Federal) on the basis of LVT. The incidence of LVT varies from State to State. In Queensland and New South Wales it is universal as the local tax, and it is the principal local tax in Western Australia. There are some qualifications of the principle. Farmers and some other kinds of businesses have managed to get partial exemption, which means that the burden on other people is higher than would otherwise be the case; but the principle is there. In New Zealand, LVT was the principal source of local revenue from colonial times until the late 1980s. Then there was a good deal of boundary reorganisation and other adjustments, but LVT remains the exclusive source of taxation for two­-thirds of the local authorities. Denmark has had LVT for local tax purposes since the 1920s. Valuation is revised biennially, and administrative costs are about a quarter of those in Britain. Soon there will be on-line access to valuations nation-wide. The three Baltic republics Estonia, Latvia and Lithuania provide striking examples. They were forced into the Soviet Union in 1940, but broke free in 1990-91. Estonia now has LVT for local purposes, and the idea of applying it as a source of national revenue as well is under active consideration. Matters have not developed as rapidly in Latvia and Lithuania, but in both there is strong interest in the idea of LVT. As in Estonia, there are periodic State revaluations of land. 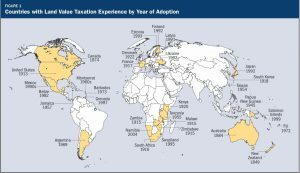 In the United States, where there is a great deal of State and local autonomy, taxation practice varies greatly from place to place. At present the main advances in the direction of LVT are in Pennsylvania, where some twenty cities have split-rate assessment for local purposes, with some tax levied on site values and some, but less, on building values. A considerable number of other States are currently examining the idea. Hawaii has had split-rate for more than forty years, and a start has been made in Virginia. A system which applies the same principle as LVT, though it works in a different way, has been applied in Alaska, where great quantities of oil exist. Alaska decided not to sell the oil reserves to private interests, but to retain them for the State and hire out rights to exploit them. Revenues from lease of those rights are now distributed annually to citizens of Alaska. A number of former British colonies apply the essential principles of LVT to a greater or lesser extent, with variations to fit the different histories of these countries. When Hong Kong became a British colony in the nineteenth century, ownership of all secular land was retained by the Crown, and anyone wishing to occupy the land was required to pay the Crown. In practice this had the same effect as LVT, although it began in a different way. When the colony was eventually returned to China in the 1990s, around 40% of the colony’s revenue was obtained in this way. There are important technical criticisms of the way in which the system has operated, but its general merit is not in doubt, and it has been retained despite the transfer to power to China. Very significantly, China is now generally following the Hong Kong model of property law, retaining freehold ownership but raising substantial revenue from leasing land to private developers. In Jamaica and some other parts of the former British West Indies, a “property tax” applies the LVT principle. This began in late colonial times and has continued since independence. At present it is only applied on a small scale, but there is pressure for extension. Soon after South Africa became a self-governing British Dominion, LVT was applied extensively for local government purposes. When South Africa adopted the principle of racial equality, LVT continued and most cities still apply it. In Namibia, where huge estates developed during the period of British rule, LVT has been applied to encourage smaller land holdings. In Kenya, local authorities have applied the system since independence. These examples are not exhaustive, but they show how the principle of LVT can be applied in countries with very different histories and economic backgrounds. In most of these places, current pressures are to increase rather than to reduce LVT. TP 23 is a fuller description of how it is dealt with in Alaska, while SA39 describes how it is working out, by Alanna Hartzog..
SA42 is a book review by Brian Hodgekinson of “No Debt, High Growth, Low Tax” by Andrew Purves, describing the remarkable results of “land value capture” in Hong Kong. SA63 gives a description and history of “The Fairhope Single Tax Colony since 1894 in Alabama, USA. We would be delighted if any reader would undertake to research and describe any other examples.